For the winter months in colder climates, high quality toddler snow pants are a wardrobe essential. Not only do snow pants provide protection from wetness, but they also keep the cold and the wind out. Like older children, many toddlers love to play outside, especially in the wintertime. While building snowmen and going sledding can be lots of fun, toddlers can get cranky really quickly if they get cold or wet. For this reason, it is essential to clothe your toddler properly before enjoying the snowy winter weather. Whether you go for snow pants with suspenders, without suspenders, or a whole snow suit, you will want to select fabrics that are truly capable of keeping melting snow out and that are well-insulated against cold and wind. Read customer reviews about each pair before making a final selection. The classic children's snow pants model is that of pants with an apron front or suspenders. The reason why so many children's snow pants models have suspenders and aprons is so that the chance of snow and cold seeping in between the pants and the jacket should be minimal. Suspender pants do not fall down, and they provide warmth around the torso. These models also have a unique ability to grow in length with your child. Adjustability in the suspender length provides a custom fit when it comes to length, which can be a life-saver, not to mention a money-saver, when outfitting your toddler. Pants that simply come to the waist level and stop there are rare for toddlers, for the reasons mentioned above. A few models do exist if you find the suspender pants to be a hassle, for example when your child needs to go to the bathroom. Another option for keeping dry and warm during the winter is to purchase a complete snow suit, which is a garment with pants and a jacket all in one, usually brought together at the waist by elastic. While these are good at keeping wetness and cold away from the entire body, getting the length of these models right can be difficult. For optimal fit, take your child shopping once the season has begun so that you know you are getting the model that is the perfect length for your child. Local shops will have a variety of toddler snow pants available. In general, you will get only the amount of quality that you pay for. If your child is outside playing for twenty minutes at a time, a simple pair of snow pants will do the job just fine. However, if your child is outdoors a lot, if your family goes skiing, skating, or any other outdoor activity for an extended amount of time, you may want to skip the local department stores and check out the features and functionality of outdoor brands such as Columbia and Patagonia. Use the following shopping websites to get your search started. Amazon.com: With a wide range of brands and prices, Amazon.com offers a lot of snow pants for toddlers and older children. From specialty brands like Columbia and Obermeyer to more affordable brands like Circo, Amazon carries it all. Altrec: An excellent resource for the seriously-outdoorsy family, this site offers outdoor wear for kids and adults alike. 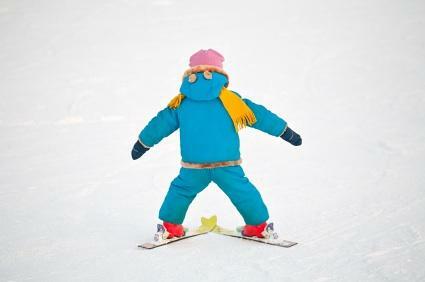 Featuring brands like Patagonia, The North Face, and Columbia, the selection of ski pants for toddlers is extensive. Backcountry: While the selection can be hit or miss at times, depending on the size you are looking for, this website offers excellent brands at reasonable prices. Campmor: One of the best bargain sites for outdoor clothing and gear, Campmor offers a selection of children's and toddlers' ski and snow pants. Count on this shop to always offer the lowest price online. Whether you and your children go outside to sled, skate, or simply roll around in the snow in the front yard, a good-quality pair of waterproof pants is an important piece of winter outerwear that will keep both you and your little ones happy and comfortable.